Today’s veal stew recipe is all about comfort. This meat stew begins with a quick sautéing of meat over veggies. (All to form a slight crust on the outside and keep mouthwatering juices inside.) 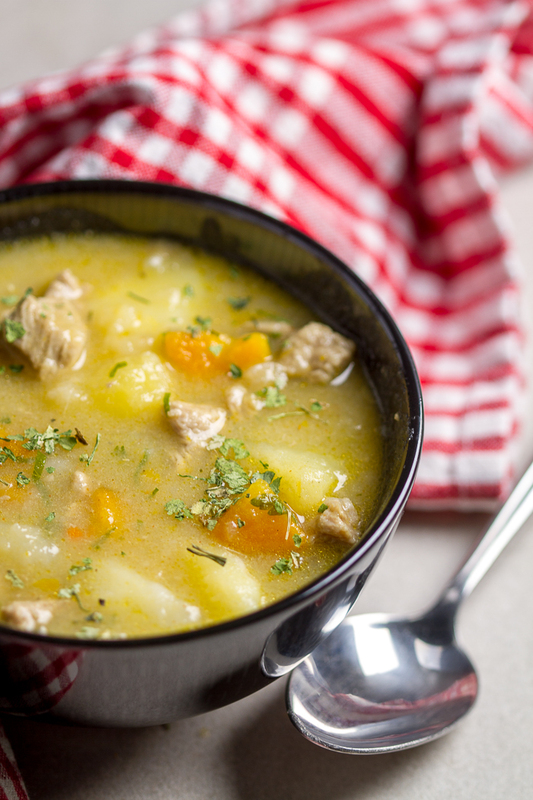 Spices, broth, and potatoes are further added, and the stew cooks to its own rhythm until the perfect ingredient softness and stew thickness are achieved. There are a few ways to return from Dalmatia (Croatia) to Sarajevo (Bosnia and Herzegovina), and most take you through Jablanica. It’s a small town in Herzegovina (southern part of the country), situated on the banks of river Neretva and Jablanica lake after which the town got its name. In addition to breathtaking views, Jablanica is synonymous with mouthwatering lamb. Restaurants line up the road at a pace of every hundred yards or so. Each restaurant boasts an impressive roasting pit decked with several perfect, scrumptious, unimaginably appetizing lambs. It may be psychological, but whenever I travel through Jablanica I smell its succulent meat from miles away. Coming back home from Herzegovina a couple of months ago, I again travelled this route. If you’re a blog regular, you may know I suffer from dentophobia. Shaking, fainting and the type of terror that has me floating above my paralyzed body. As the only dentist I trust practices in a small Herzegovina town, that’s where I go to do my teethwork. Due to work I had done I couldn’t have traditional Jablanica lamb this time. As soft and falling-off-the-bone it is, little parts of meat always find their way in between teeth. (Tip: toothpicks are your best friend when devouring lamb.) And mine were done being prodded for the day. As a result, I spent an exuberant amount of time at one of the restaurants (more of a kafana really) choosing what to eat. This is unusual. I’m usually hungry. And I usually know what I want to eat. But what else is there to eat in a place so well known for its lamb even Wikipedia’s only two photos from the area are of lamb roasting? What’s This Veal Stew Recipe All About? Veal stew (sometimes it’s just called veal soup) is one of those meals that’s on the (unwritten) menu of almost every kafana (kah-fah-nah) and restaurant from here until the end of Balkans. Kafana is what we call an old school bar. Neither a restaurant, nor a diner, nor a coffee shop, nor a proper bar. Kafana is in a class by itself. Except for alcohol and coffee, you never know what you’ll be able to order. 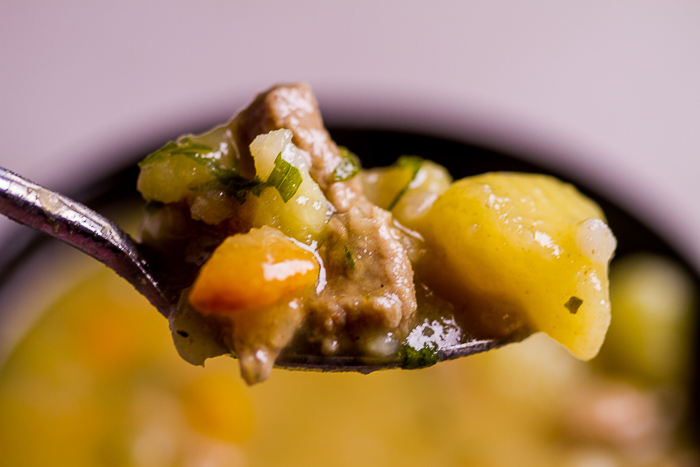 Often you’ll find treasures like veal stew (soup) even your grandmother wouldn’t be ashamed to serve. These stews are full of flavor. I thought if anything the stew would go easy on my teeth. (And warm me up as the day was cold.) But it did much more. It brought back memories of comfort that food brought to me at crucial junctures. And I don’t mean those times I used it as an emotional crutch as we occasionally tend to do. I mean those times I was really hungry. When I was 12 and all of 55 lbs during war. Sometimes all that divided me from survival was a warm plate. And here I was in the present, with a bowl of comfort that elicited memories and fed at the same time. It was evident the veal stew recipe was in this kafana’s arsenal for a while. It was that good. This meat stew was of just the right thickness. More substantial than regular soup. Definitely heartier than grits noodle, but not too much. Even with plenty of veal, the stew didn’t feel dense the way the traditional Balkan bean stew (aka grah or pasulj) sometimes can. And if you’re wondering the difference between a soup and a stew, stews are generally thicker and more filling. Then again, some soups are also hearty and thick. It’s hard to draw the line between the two sometimes. 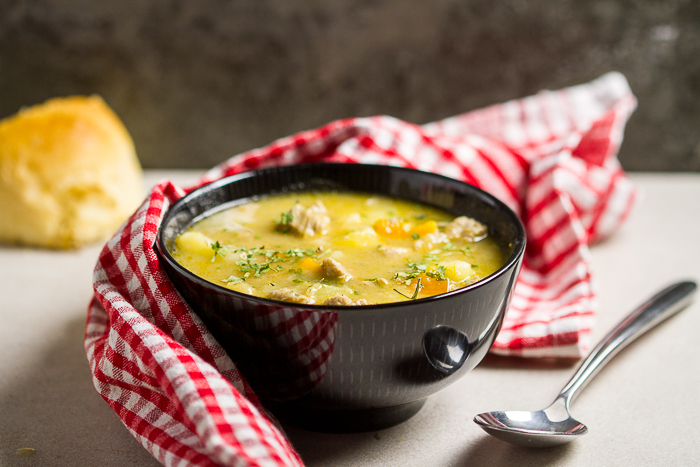 Bosnian word for stew is čorba (ch-or-bah). 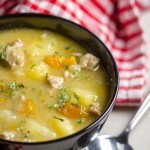 (Today’s veal stew recipe is translated as teleća čorba.) 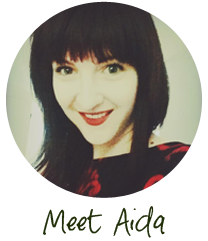 And like kafana is neither a restaurant nor a bar, čorba, to me, is something in between. Neither a soup nor a stew. More substantial than a soup, but as already mentioned, not as heavy as some stews can be. Yet it’s perfectly filling. Along with some bread, it’ll more than satisfy you. The stew walked that perfect border between warm and hot, the way good stews do. Logically, the warmth factor has more to do with people who prepared and served it, than it being an inherent stew characteristic. Still, there is an art to knowing just how much to warm up a stew or a soup. I like it just enough to leave a remaining trail of warmth as it travels from the mouth to the stomach. There was a julienne-style cut pepper or two mixed with stew meat, and definitely carrots. I also tasted a small amount of (finely diced) onions, which probably fortified sautéing at the beginning. Although you could probably throw in a couple of more vegetables in (root veggies definitely), you don’t need more than that. Carrots, onions, peppers, and potatoes are plenty of vegetables for a proper stew. In color the stew was yellowish going on orange. It had just enough depth of color where you knew it would be filling. (None of that watery, see-through look soups have.) And that it was probably helped by a bit of a thickener in form of starch or flour. As far as spices, it was the standard Balkan cuisine spice medley. It had plenty of (non spicy) paprika which possibly aided the color of the stew. I detected salt and pepper to taste, and added a little bit more salt. And I tasted what probably is Vegeta or a similar spice mix. They didn’t give me an exact veal stew recipe there. Well, they did say to mix a little bit of this with a little bit of that. And that it cooks better when you cook it for more people. That adding or subtracting ingredients won’t take away from its quality. You know, the typical stew talk. Back home however, Aleksandra and I recreated the stew down to the last morsel of taste. And that’s the recipe you’re getting today. You start by sautéing onions, carrots and peppers. If you’re after a deeper orange color, you can add a tomato or two as well, or more paprika. (Usually, the sweet kind is used.) After a little while you add (small dice) veal. Then come seasonings. Here and there splash a bit of beef broth to turn the sautéing into a simmer. Lastly you’ll add potatoes. Dice them small. When you think they’re too small, cut each piece in half. Finally, top it off with the remaining beef broth and cook for a while. Garnish with parsley. You’re done! Oh, salt and pepper to taste, of course! But Aida, I don’t eat veal! Now on to the actual veal meat you’ll be using for the stew. I understand some of you, especially those living in the US, have moral qualms about eating veal. And until recently, with good reason. It looks like in the 1970s people in the US ate about 4 pounds of veal per person. This number fell to 1/3 a pound by today. Two reasons seem to be main culprits. One, (the former) inhumane treatment of calves. Two, people don’t know what to do with veal. For those of you not familiar with veal, it’s the meat we get from young calves. (At the time of slaughter they’re about four or five months.) Veal industry in the US ran parallel to the dairy industry. Female calves were used for milk production while male calves were consumed as veal. Until recently, most of veal production in the US included holding calves hostage in tiny crates. They were fed with hormone induced milk. This, deservedly, caused an outrage. However, this trend is changing, and grass fed veal is becoming more available. In the Balkans, veal industry is relatively humane. If we’re honest with ourselves, no meat industry can be called humane. We raise animals. We slaughter them. We eat them. I’ve come to terms with this. I love meat. But let’s call it what it is. What’s meant by relatively humane is that calves are raised in better conditions. Veal is very accessible in the Balkans. However, due to its delicious taste plus a hungry market, it’s one of the most expensive meats around. 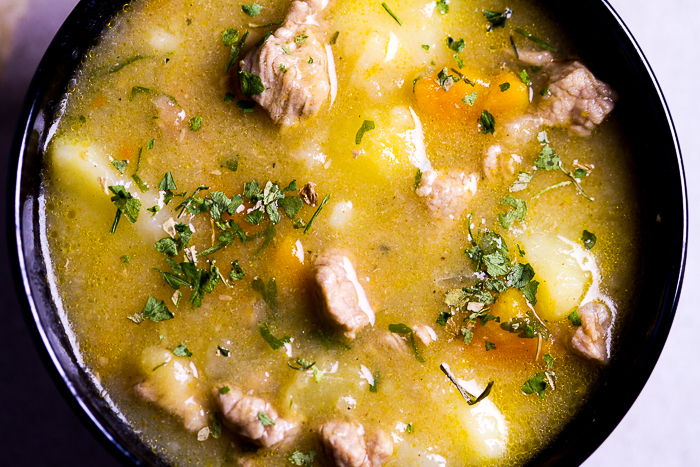 And so many delicacies – like today’s veal stew recipe – are made with veal. It always finds its way to the dinner table. Veal tastes like a very tender version of beef. Physically it also has a softer feel. It’s lighter in color than beef, ranging from pink to a lighter red. Tip: stay away from veal that’s extremely pale pink if you live in the US. That’s the kind where calves are fed milk and kept in crates. If your veal reservations have to do with how to make it, I can recommend two things. One, anything you make with beef, you can make with veal. (Except maybe steak.) So in your recipe, scratch out beef and put in veal. For one, the famous Wiener schnitzel is made with veal. Two in addition to today’s veal stew recipe, below are additional veal recipes on the blog you’re welcome to try! 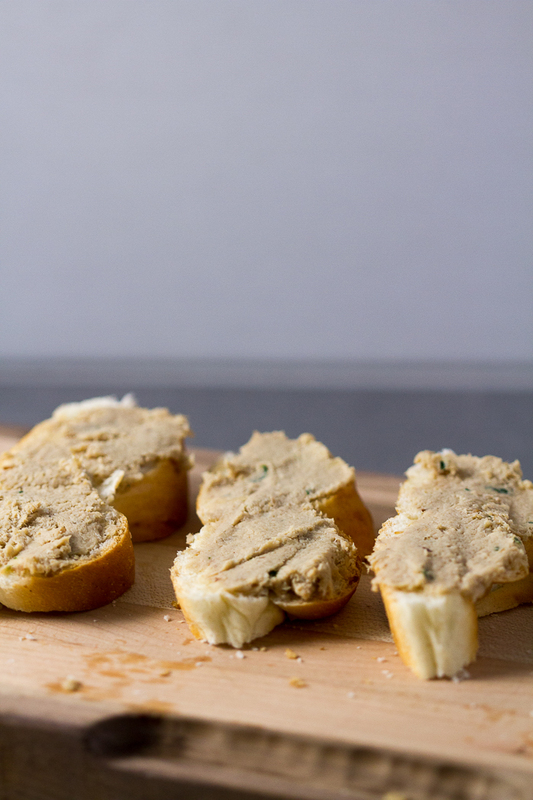 Veal pâté is a smooth spread that is both an appetizer and a side dish. Rich meat flavor is sweetened and simmered in onions, then additionally softened by blending with mayonnaise and sour cream. It’s not a surprise this decadent spread is everyone’s breakfast favorite. 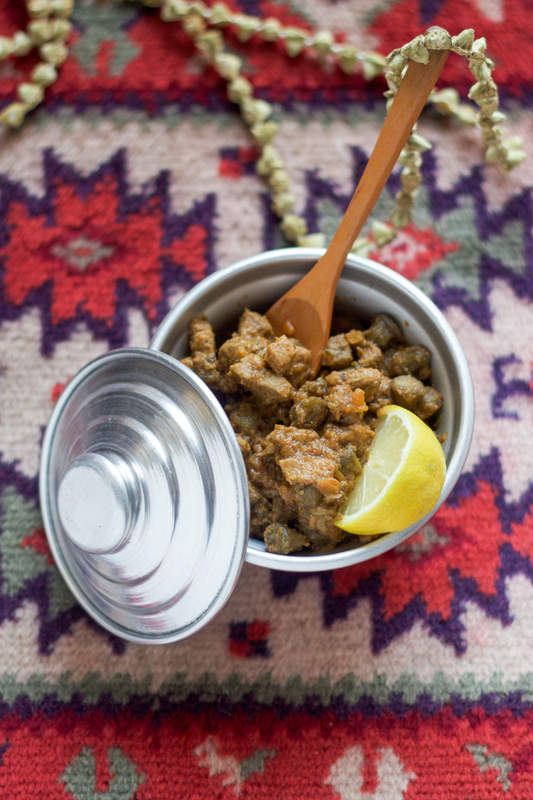 An old school Bosnian dish, quite similar to today’s veal stew recipe. It’s all about tenderly simmering the veal. The more you simmer the tastier! Okra, usually the dried kind which was previously braised to free it from bitterness, is added. The beauty of this recipe is you can make it as crunchy or soft as you’d like. I recommend soft. Here okra shows the full spectrum of its taste which pulls toward asparagus with tones of green beans underneath all of which is grit and freshness. FUN FACT: Cleopatra and women of her age believed in okra’s property to keep the skin youthful and protect it. She ate loads of it. In a medium sized pot heat oil over medium. Add onion and sauté 2 minutes, frequently stirring. Add carrot and continue sautéing another 2 minutes, frequently stirring. Add pepper and continue sautéing and stirring an additional 2-3 minutes. Add meat. Stir well and keep sautéing 10 minutes. Add spices, flour and 1 cup of broth. Stir until well integrated. Add potatoes and remaining broth and stir yet again. Cover pot with its lid and cook 25 minutes. Nutrition information calculated at https://www.verywellfit.com/. I opted for the secret veal and although my family gave me a terrible time for not eating the lamb – it was well worth it. Don’t get me wrong, ordering lamb by the kilo and having it served on giant platters is wonderful but finding veal in southern California is almost impossible and very often people make you feel criminal for buying it, so I eat as much as I can when I’m there. 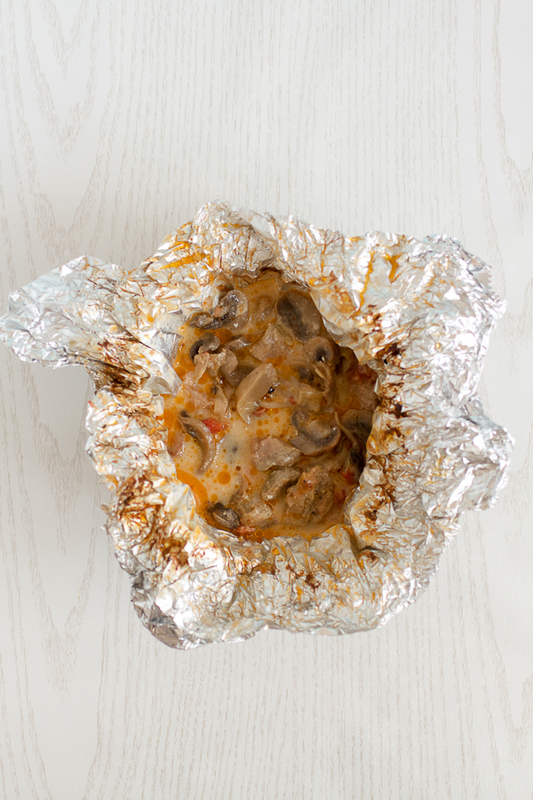 All of your recipes are great and if followed exactly, they are ALWAYS delicious and authentic…can’t wait to try this one! Let us know next time you’re in Bosnia! Hope you had a satisfying trip. I know what you mean about lamb. I love it, but every so often it’s great to try something else. Hopefully the climate of veal acceptance will change even more as the industry improves. Glad the recipes are working out, that’s the best compliment you can give us.